Having already spoofed itself with The One Doctor, Big Finish wanted to do the same kind of thing again for the Christmas release of 2002 and thus this release was created. A Galaxy Quest-like roast of Doctor Who's counterpart from across the ocean. Bang-Bang-A-Boom spoofs Star Trek in big ways. Featuring an interesting bunch of aliens from across the galaxy all gathering on Dark Space 8, (or Deep Space 9 to us Trekkies), they have gotten together for the latest round in the Intergalactic Song Contest, think Eurovision, but murder in the air. And then, the Doctor barges in and takes command of proceedings like he is Captain Kirk. He even gets to play the womaniser that Kirk is thought of but actually wasn't! One actually finds it hard to give a lowdown on the plot or secondary characters because they are both so superficial. And there is only enough plot for the first three of the four episodes. Episode four finds just about enough silliness to keep it going, just like The Rapture. The musical cues are far more over-the-top than they needed to be, even though this is supposed to be campy fun. However, having said that, it did take me till episode three to work out who the murderer was, so there is some hidden depths in this release. 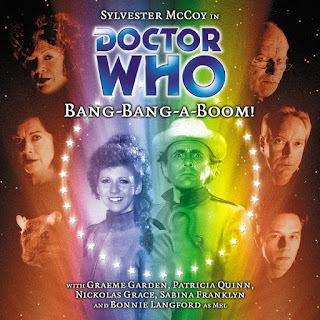 This release also sees Sylvester McCoy being allowed to indulge in almost lethal amounts of oratory and mangled metaphors and it is lucky that I actually enjoy his clownish incarnation from his first series as I enjoyed the fun vibe of his opening series. But if stories like The Greatest Show in the Galaxy and Paradise Towers don't appeal to you, then this release isn't one for you. But my main problem with this story isn't the plot but the two secondary female characters. They are quite possibly the worst science-fiction female stereotypes of all time. We have a bad Dr. Crusher and a bad Elaan of Troyius, played by Patricia Quinn. And the 'pits of Angia' scene made me all kinds of sick! And the best part of this release? It was the first Big Finish release to actually feature an authentic Doctor Who title sequence. This has the Seventh Doctor theme tune and not the Fourth Doctor's.